How advanced are the different countries actually? Credit Suisse economists analyzed 36 countries and prepared a ranking. The 2018 Progress Barometer compares the progressiveness of countries based on real economic indicators. The inaugural study was carried out by marketing research firm gfs.bern between July and August 2018 on behalf of and in cooperation with Credit Suisse. In the early 19th century, Switzerland was a poor country. Today, in contrast, it is one of the richest, most innovative and competitive nations in the world. This success has many fathers, as the saying goes. No doubt, one of the most important was Alfred Escher, who consistently promoted the expansion of the railway network, co-founded a technical university (now known as the Swiss Federal Institute of Technology Zurich, or ETHZ) and founded the Schweizerische Kreditanstalt, what is now Credit Suisse. Even today, his entrepreneurial mindset is deeply anchored in the essence of Credit Suisse. "A country needs infrastructure to achieve prosperity and progress," says Urs Rohner, Chairman of the Board of Directors of Credit Suisse Group. "It needs education and research. It needs banks to provide loans and facilitate growth." This is true for every country that wants to remain progressive, not just Switzerland. Read more about the Progress Barometer in the Bulletin special edition. But who is actually ahead in terms of progress? The Credit Suisse economists wanted an exact answer to this question and analyzed 33 European countries along with the US, Australia and Japan in terms of progress. The real economic analysis was based on the five supertrends defined by Credit Suisse: "Angry societies – Multipolar world", "Silver economy", "Millennials' values", "Infrastructure" and "Technology". "We believe that these trends reflect the major economic, societal and political changes of our time and will leave their indelible mark on the future," says Claude Maurer, who directed the study. "The countries which hold a good position in terms of these supertrends are well prepared to successfully master the future." The bank selected between five and eight real economic indicators for each of the five supertrends to provide an indication of how the different countries are doing in each area. For example, the result of the supertrend "Angry societies – Multipolar world" incorporates data on the perception of corruption, happiness of the population, polarization of the political landscape, the division of wealth, long-term unemployment, as well as data on populations at risk of poverty or exclusion from society. For each of these indicators, economists used publicly available data from third-party sources. Most of the data is from 2016. Each country has been ranked on a scale from –100 to +100, with –100 indicating the least progressive and +100 the most progressive of all 36 countries analyzed. A zero represents the precise halfway point between the worst and the best country values. For the supertrend just referenced above, "Angry societies – Multipolar world", Finland ranked first, ahead of Norway and Denmark. The 18 top-ranked countries of the 36 countries analyzed. The supertrend "Silver Economy" incorporates indicators into the ranking such as the quality of pension systems, the financial situation after retirement, the number of people in the workforce between the ages of 55-64, health expenditure by provider, and life expectancy. Switzerland takes the top spot in this ranking, followed closely by Norway and Australia. For the supertrend "Millennials' values," where indicators such as overall sustainability (measured using an environment and social governance rating), internet purchases, digital skills and youth unemployment are important, Switzerland proves to be the most progressive. The same holds true for infrastructure, where the telecommunications "Infrastructure", the length of highways and railways, freight volume, transportation infrastructure and the share of renewable energy are the important aspects. It is also most progressive in terms of "Technology". "When it comes to digital skills, Switzerland is ranked only seventh. Yet it is investing an enormous amount in research and development," Maurer explains. "The government provides a relatively large amount of funding and high-tech goods represent a large share of the exported finished goods." "Within Europe, our study indicates a clear north-southeast divide," says Maurer. "Measured on the basis of the supertrends, northern countries such as Norway, Iceland, Sweden, the Netherlands, Denmark and Finland are highly progressive. There is a greater need to catch up in the southern and eastern parts of Europe." Australia is future-oriented, coming in eighth thanks to its high scores on the supertrends "Angry Societies – Multipolar world" and "Silver economy". 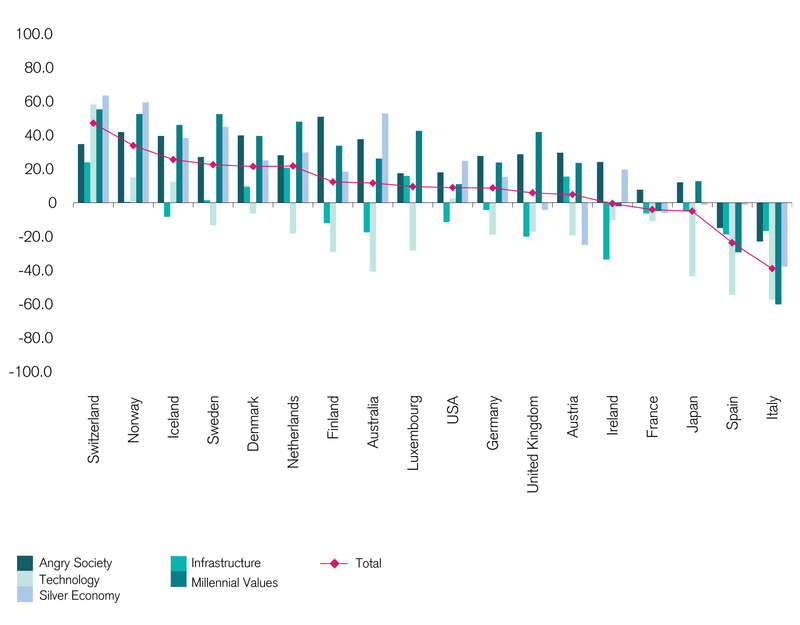 The US tops the middle group at number ten, performing well particularly in regard to "Technology", even taking the overall lead in spending for computer software as a percentage of the GDP. Following closely behind the US, Germany comes in at number eleven, followed by the UK. Also in the midfield are France and Japan at spots 15 and 16. The latter has the highest life expectancy but still seems to be the least progressive when measured by the quality of the pension system. Switzerland tops the overall ranking. "The result was not surprising to us in the sense that in analyses of future viability, Switzerland has always been one of the top countries," Maurer explains. "Even in the simplest benchmark in some senses, per capita GDP." However, there are some contradictions. The country's direct democracy slows progress, yet it also prevents negative outcomes. "Many Swiss citizens consider their country to be not particularly dynamic. However, they also think they are certainly able to find viable solutions when necessary," says Maurer. "The industry stakeholders are considered to be quite agile. We estimate that one in seven Swiss SMEs is a global market leader in a very specific field."